In cases where you have raised the invoice but have not yet delivered the goods or services, you are able to utilise accrual dates so that the revenue is realised in the related period. An example would be if you are a business which supplies a training service, where you may invoice the customer on 01/01/18 but the training is not carried out until a month later. Therefore, you are able to input an accrual date of 01/02/18 so that the revenue is recognised in the correct reporting period. Navigate to the Settings > Configure system > Toggle features menu. 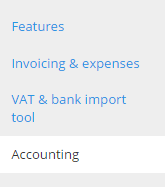 Tick the checkbox next to Accrual dates. You will now be able to select an accrual date when either creating an invoice (shown in the example below)/bill or explaining a transaction. In this example, the revenue will then be recognised on the Profit and Loss report on 26/01/17 rather than the invoice date.